Start your holiday from the moment you arrive with private taxi transfers from Go North Cyprus. Bypass long taxi queues, and forget boring coach transfers that stop at everyone else's hotel before yours! With a private taxi transfer from Ercan Airport, for example, you can be at your Kyrenia hotel within 45 minutes of landing. All our transfers are private taxi transfers in spacious air-conditioned cars or people-movers, with helpful and careful drivers. We can arrange private taxi transfers for any part of Cyprus. Just type in the first few letters of your pick-up location into our search box, and choose your location. Forget the queues for Ercan airport taxis, and pre-book a private transfer from Ercan airport to your Kyrenia hotel, beach resort or rental villa with Go North Cyprus. With private transfers from Ercan to Kyrenia, you can be relaxing in your hotel in just 40 minutes, while other guests are still on the transfer coach! 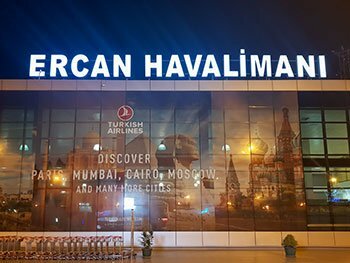 Your friendly Ercan transfer driver will meet you in Arrivals and carry your luggage to your private taxi. Hop into our comfortable air-conditioned car or people-mover, and relax as your private taxi from Ercan airport to Kyrenia or Famagusta speeds you through lovely countryside. With Go North Cyprus, your Larnaca transfer is easy and so relaxing. 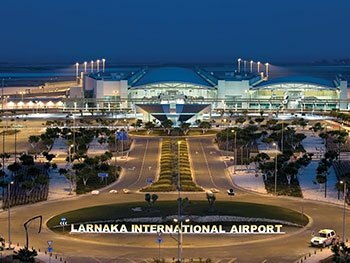 Our experienced Larnaca airport transfer driver will meet you in Arrivals, and help you to your private taxi parked next to the terminal. Sit back and relax in air-conditioned comfort in our spacious clean cars - no hire car forms to fill in, no hotel transfer buses, no taxi queues, and no family arguments reading a map! With all transfers from Larnaca to Kyrenia and Famagusta, you'll make a brief stop at a border crossing, where your driver will take care of all the necessary paperwork in about 2 minutes! Your North Cyprus holiday is all about relaxing, so if driving abroad stresses you out, let our private taxi drivers do the work while you watch the scenery! With a private driver in North Cyprus, you can go wherever you want without worry. • Explore Famagusta with a day trip from Kyrenia - no parking or traffic worries! • Villa hunting? Save time and visit several North Cyprus estate agents in one morning; our drivers know where their offices are!